If someone asked me to make a lemon tart, I’d say no way. I can’t do that. A pan of brownies? Now you’re talking. I’m a baker at heart thanks to my great grandmother Mimi. But intense desserts that require things like tempering, a double broiler, or a thermometer—no thank ya. I stumbled upon a beautifully photographed dessert (much better than my photographs here). Berry Tart with Lemon Curd Mascarpone. Don’t let the name scare you. This dessert is really easy to make and it’s a real show stopper. I was so inspired by the photo that before I knew it I had strawberries and raspberries in my basket. This recipe is so easy even I could do it and so can you! The final product will have you looking like a pastry chef. Your guests will be so impressed with the looks of this dessert and it’s delicious. It’s so light yet rich with mascarpone filling (Italian cheese). The crust is so good I could eat it alone. I didn’t use almond flour, instead I used all-purpose flour in place. If you want to shave time buy lemon curd at your specialty grocery store. Otherwise it’ll take about 20 minutes to make from scratch. You can use any kind of berries for the top, blueberries, blackberries, huckleberries too! This berry tart with lemon curd mascarpone will knock your socks off! 1. Mix flour, almond flour, salt and powdered sugar in a large bowl. Add the unsalted butter pieces and work into the flour, creating thing sheets of butter in the flour. Mix the egg yolk with 1 tablesppon water in a small bowl and add to the flour and butter mix. Continue to work with your fingers until the mixture sticks together when pinched. Add another tablespoon of water if needed. 3. Preheat the over to 375 degrees. Bake the tart for 12-15 minutes or until golden brown. Allow to cool completely before filling with mascarpone filling. 1. 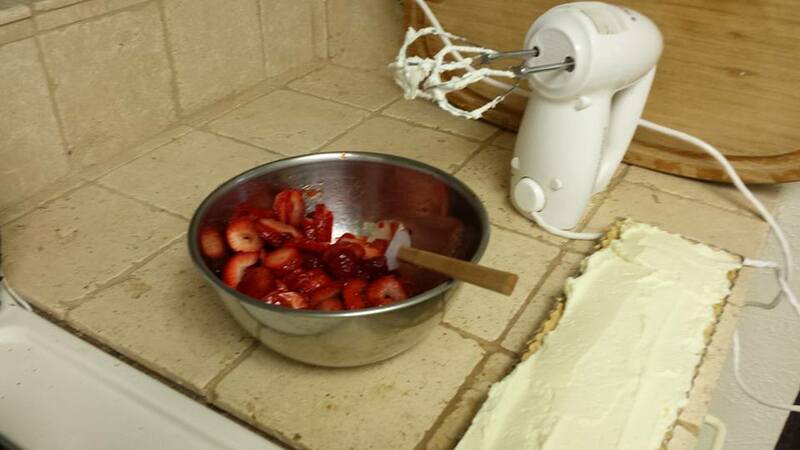 Whip the cream on high with a hand mixer or stand mixer. 2. Add the softened mascarpone cheese and powdered sugar and beat to mix well. Fold in the lemon curd with a wooden spoon. 3. In a separate bowl, mix the raspberries and sliced strawberries. Heat the strawberry preserves until thinned and mix into the berries. Spoon the mascarpone into the cooled tart crust and top with the berries. Garnish with mint leaves. Melt the butter over low heat (the pan should be just warm enough to melt the butter)…don’t rush or it’ll burn. Measure out the sugar into a medium bowl and zest a few lemons into it. Then squeeze about ½ C of lemon juice into the lemon zest/sugar mixture. Separate the eggs, dropping the yolks into the pot of melted (but not hot) butter and the whites into the sugar mixture. Whisk the yolks and butter together until well combined. Careful not to overcook, you don’t want to scramble the eggs. Then take the whisk to the sugar mixture until well combined. Pour the sugar mixture into the pot with the butter and whisk it all together. Turn the heat back on to low and use a whisk to constantly stir the mixture, scrapping the bottom & sides of the pan to make sure nothing burns. (instant read thermometer should read 170 degrees & should be golden) Otherwise just keep stirring until the curd thickens enough to coat a spatula. Don’t overcook it. As soon as it’s done, take it off heat & pour through strainer. Thanks to the Foodie Crush for this wonderful recipe and inspiration. Enjoy! I needed inspiration for a potluck at work tomorrow! This is perfect! Thanks for sharing!!! !